2. Instructions were issued vide this Department’s OM of even number dated 28.1.2013 for stepping up of pension of pre-2006 pensioners w.e.f. 24.9.2012 to 50% of the sum of the minimum of pay in the pay band and the grade pay thereon corresponding to the pre-revised pay scale from which the pensioner had retired, as arrived at with reference to the fitment tables annexed to Ministry of Finance, Department of Expenditure’s OM No. 1/1/2008-IC dated 30th August, 2008. A concordance table indicating the revised pension/family pension of pre-2006 pensioners in terms of instructions contained in para 4.2 of OM dated 1.9.2008 read with the OM dated 28.1.2013 was also annexed to the OM dated 28.1.2013. Subsequently, orders were issued vide this Department’s OM of even number dated 30.7.2015 that the pension/family pension of all pre-2006 pensioners/family pensioners may be revised in accordance with this Department’s OM No. 38/37/08-P&PW(A) dated 28.1.2013 with effect from 1.1.2006 instead of 24.9.2012. 3. In the aforesaid OM dated 28.1.2013 of Department of Pension & Pensioners’ Welfare, the grade pay corresponding to the pre-revised pay scale of Rs. 6500-10500 was shown as Rs. 4200/- and the minimum pension in terms of para 4.2 of the OM dated 1.9.2008 was shown as Rs. 8145/- (50% of minimum pay of Rs. 16,290/- as per fitment table for the pre-revised scale of pay of Rs. 6500-10500, annexed to Ministry of Finance, Department of Expenditure’s OM No. 1/1/2008-IC dated 30th August, 2008). 4. Order were issued vide Ministry of Finance, Department of Expenditure’s OM No.1.2008-IC dated 13.11.2009 that the posts which were in the pre-revised scale of Rs. 6500-­10500 as on 1.1.2006 and which were granted the normal replacement pay structure of grade pay of Rs. 4200/- in the pay band P13-2, will be granted grade pay of Rs. 4600/- in the pay band PI3-2 corresponding to the pre-revised scale of Rs. 7450-11,500 w.e.f 1.1.2006. 7. In accordance with the provisions of Rule 7 of the CCS (Revised Pay) Rules, 2008, the pay corresponding to the pay of Rs. 6500/- in the pre-revised pay scale of Rs. 6500-10500/- would be 12090/- in the PB-2. After adding the grade pay of Rs. 4600/- , the pay in the Pay Band I Grade Pay corresponding to the pay of Rs. 6500/- in the pre-revised pay scale of Rs. 6500-10500 would he Rs. 16690/- (12090+4600). Accordingly, the revised pension w.e.f. 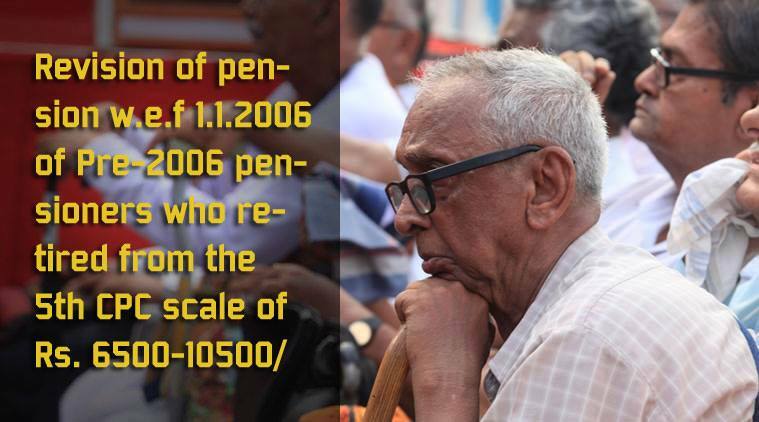 1.1.2006 in terms of para 4.2 of OM dated 1.9.2008, for the pre-2006 pensioners who retired from the pay scale of Rs. 6500-10500/- in the 5th CPC or equivalent pay scales in the earlier Pay Commissions would be Rs. 8345/, Accordingly the entries at serial number 13 in the annexure of this Department’s OM No. 38/37/08-P&PW(A) dated 28.1.2013 may be substituted by the entries shown in the statement annexed to this O.M. 8. As provided in this Department’s OM dated 28.1.2013, in case the consolidated pension/family pension calculated as per para 4.1 of this Department’s OM No. 38/37/08- P&PW(A) dated 1.9.2008 is higher than the pension/family pension calculated in the manner indicated above, the same (higher consolidated pension/family pension) will continue to be treated as basic pension/family pension. 9. In their application to the persons belonging to the India Audit and Accounts Department, these orders are issued in consultation with the controller and Auditor General of India. All the Ministries/Departments are requested to bring the contents of these orders to the notice of Controller of Accounts/Pay and Accounts Officers and Attached and subordinate Offices under them. They are also requested to revise the pension of the affected pre-2006 pensioners in accordance with the instructions contained in this O.M. on a top priority basis.